Viral Content Study - What's A Viral Post REALLY Worth? Viral Content Study – What is it ACTUALLY worth? We studied viral content for a month… the results will surprise you! How do I get content to go viral? My content went viral but I didn’t see any extra sales! How do I make the most of viral content? The illusive process of making content get shared far and wide, to the right people is the first question on small business owner’s lips. When they hire a social media manager, they expect her to send their (home made) advert viral – inspiring people to get excited and share a negligable discount on a niche item. This is NOT viral content. THis is a service provided by cut rate freelance social media managers who have set up and “own” tens of thousands of social media profiles. Yes, they’ll share your content to all of them, but it won’t actually bring you any results… not one. We’ve examined the Insights and Analytics of dozens of viral posts from the last 30 days. 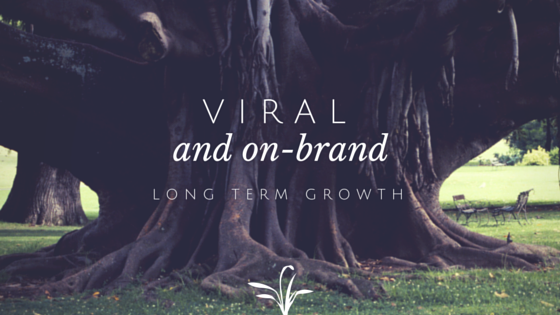 Here’s our findings on the real impact of viral content for your brand. Sometimes a repost or retweet goes viral and you get yourself a few new followers. That’s cool. You want new followers… or do you? Do you actually want mailing list sign ups? Or to connect with influencers? Or to generate sales or enquiries? Do you want existing clients to see it and feel confident to use your brand again? What you want to achieve doesn’t just come down to how you set up an ad, it’s where you funnel people with the content. Retweeting something viral might get you new Twitter followers but it doesn’t get them coming to your website to “sign up”. Repinning might make your Pinterest profile pretty but without a strategy, it doesn’t get Pinterest influencers to follow you too. There’s no point in making something travel far and wide if it doesn’t achieve your goals. What is it: Sharing/re-tweeting/re-pinning viral content that is in the early stages of virality. Goals it will achieve: Get your brand name in front of social media subscribers. What is it: Sharing/re-tweeting/re-pinning content that is from a highly reputable source that will get great exposure just on brand size. What is it: Download and re-uploading content that is in the early stages of virility because it’s obviously awesome. This makes your page the “source” but it carries legal and ethical dilemmas. What is it? Creating an original, quality blog post and then sharing it to social media. This is the hardest type of content to “send viral”. Goals it will achieve: Increased brand awareness, showcasing your skills, direct sales, email sign ups, click through. The followers that you attract will be far more likely to become customers. Influencer status. Goals it won’t achieve: It’s less likely to get you as many new fans/followers unless it gets widely shared. It’s less likely to get your brand name to “travel virally”. What is it? Identifying trending topics and then recreating these (via blog content) in a way that is more relevant and valuable to your audience. It is the easiest way to get your own content to go viral. Goals it won’t achieve: Brand value as an original influencer. This is vital in the B2B niche and also for Google to rank your content higher in results. Sharing content that will go viral because it’s a cute kitten or an inspirational quote will get you a few new fans for sure. The problem is that if they’re not likely to buy from you or enjoy your “on-brand” content, they’re actually a liability. On Facebook for example, the reach on your page is determined by the percentage of people who see your content who engage with it (via time spent reading or active engagement such as likes, clicks and shares). The more “empty” likes you have, the harder it will be to spread “on brand” content. Hopefully, the kind of person that “shares” your off-brand content but then likes your page is a “lucky hit” – that one person in a thousand views that is actually interested in your product or service too. When you send your brand viral with off-brand content, acquiring a handful of new fans is not a failure, unless you never hear from them again! Encourage an action, so make sure that the status is long enough to get them to click the “read more” or there’s a reason for them to comment. This will drive the post further forward and reach more of those one in a thousand fans. Remember that “on-brand” could just mean in the voice you use on your page. If you’re a quirky funny blogger, or you communicate on your page in a fun voice, you’ll be able to engage enough with these new fans that they grow to love your brand…and buy your product. We’ve all been there, spent hours on a useful, insightful and fun article or design, only to see it get largely ignored on social media. This might be a sign that you’ve built the wrong audience, or that your audience is changing. It could also be a sign that your content isn’t as great as you thought it was. Maybe the image and copywriting of the status update just isn’t appealing. It could also be that it’s branded, so people just don’t want to share it. They may be interested in the topic but not enough to read it. On social media, they want you to “just tell them” what they need to know or “just entertain them” so they can get on with their own busy days. So, what’s a social media marketer to do? Just because it didn’t go viral today, doesn’t mean that prospective clients aren’t “sussing you out” to find out if you’re the right provider for them. Your page or profile reach per post is one thing, but your ongoing presence across the social media platforms that your clients use is what will land you long term spenders. This is especially important on both Facebook and LinkedIn. Facebook is the biggest, everyone knows how to use it, eventually they’ll come looking for your services. LinkedIn is the place clients go to find providers – especially if you’re a B2B or corporate product. Keep producing excellent content, build it, they will come – if they see nothing but kittens, they’ll leave again. How to use the content fruit left on the shelf! Make lemonade! Use your “ignored content” to create a page/boards/feeds that make actual converting clients go – wow – this company knows its stuff! Display well – use eye catching images, enticing status updates and exerpts from your articles to hook in potential readers. Remember that this is social proof – be sure that some of your expert content is visible at the first click to your page/feed. This may mean scheduling on-brand content every three or four posts. Answer their questions, don’t sell your stuff. The rules of social media marketing are well known, if you don’t know how to use a platform to build a tribe, then read up on it first. The sweet spot, the holy grail, the most desirable outcome for any social media marketer. So you’ve produced something that NAILS your audience’s needs. It’s getting shared like mad, it’s reaching influencers, provoking conversation around your brand, blog or website. It’s like the most amazing dessert minus the calories. You have ten thousand million trillion new fans and they’re all excited about your product or service – and you make exactly no money from it…. How did this happen? Without planning for a viral post, you have no way to capture the contact details of your new fans. You have no items ready for sale. You have no “sign up now” form. You just have a lot of new people following you, and you back competing with every other brand for their attention. Planning. Plan plan plan. Sometimes it will come as a complete surprise that your content went viral – at the very least you should have lead captures set up on your website. Have a plan in place to get them off this one blog post and moving towards your sales pages. Ensure that the images you shared have your URL on them – no point in letting someone else grab them (the idea will be taken immediately, but the images can at least carry your name). Submit it to appropriate content amplifciations sites like Buzzfeed to get wider growth. It’s proven, may as well turn it up to 11. Be ready to go with an offer on the product or the service that is the focus of the viral content. If you’re a blogger, be ready to go with anything that will enhance your monetisation strategy. Use Google Analytics to track metrics such as traffic, soft conversions, hard conversions and social sources. This will be vital to recreating the viral activity in the future. Analyse WHY this went viral and your other content didn’t. Was it an influencer share that kickstarted the spread? Was it the coolest image of all time? Was it simply that you said something or did something that nobody else said or did? The answers to this will give you insight into your market and help you plan for future campaigns. The bottom line – is there money in all this? We found that the number of “new fans” we acquired from irreverent “meme sharing” was (surprisingly) similar to the number of fans acquired from non-viral but highly targeted content (although the engagement on memes was far greater). Further more, we had a 12% soft conversion rate on fans that arrived via on-brand content. From our own data, we expect a 4-6% hard (purchase) conversion from these*. We expect 0% from the “meme” sharing at this time. To learn how to measure the value of individual Facebook followers check out our article on it here. While how you share content will big a large contributor in its likelihood of “going viral” the level of targeting and the quality of your content will always be the main factor in virility. No matter where you post your content, or how you share it, if it doesn’t strike a chord with the right audience on the right platform, it will never “go viral”. Do you know why your social media marketing is failing? We can help, just get in touch! Are you using social correctly? Are you aware of all the areas you could be “tapping”? Find out more here. The Talk About Creative blog has vital information for small business owners, a marketing managers and resellers, we’re here to help! Over thirty days we monitored 12 Facebook pages – we also observed their corresponding Twitter feeds, Linked In profiles and Pinterest boards. We defined “viral content” as content that was seen by more than 200% of the page’s fan base via sharing. From these we looked at follower acquisition, click through rates, conversion rates and posting styles. Using Facebook and Google Analytics data, we tracked individual “fans” and their behaviours. NOTE: We used our existing understanding of social media activity to draw some conclusions. We are aware that the sample size and the data collected does NOT deliver results compliant with the scientific method. This article is to assist small business with making social media sharing decisions.